During the first two months of 2013, Wacker’s chemical divisions reported satisfactory demand amid the usual seasonal effects of winter, as announced in the company’s annual report. In total, Wacker expects 2013’s first quarter sales to outperform the fourth quarter of 2012, but to fall short of the 2012 first quarter figure, since polysilicon prices back then were almost twice as high as today. At its polysilicon division, Wacker is currently selling much higher volumes than expected with prices currently stable at a low level. At Siltronic, there is no indication yet of any fundamental turnaround. Demand for semiconductor wafers is still weak, and prices are low. For full year 2013, Wacker forecasts sales at the year-earlier level, providing that no major trade barriers are introduced in the solar industry and that semiconductor demand picks up in the second half. Volumes at every division are expected to grow further. Sales at Wacker Silicones are expected to increase, though the price squeeze on standard products will remain. Additional demand will primarily come from Asia. Wacker Polymers is targeting sales growth, too. The regions with the highest sales gains are likely to be China, India and the Americas. In Europe, projections are for only a slight sales increase. Wacker Biosolutions also anticipates higher sales in 2013. The division sees its major growth opportunities in Asia, and also in Germany. As announced earlier, Wacker Chemie AG posted sales of 4.63 billion euros in 2012, just under 6% below the previous year’s 4.91 billion. 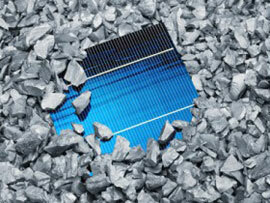 The decline was chiefly due to weaker prices for solar-grade silicon and semiconductor wafers, its annual report stated.